Samsung Trifold 8" for Galaxy Tab S2 & Galaxy Tab A is rated 1.0 out of 5 by 1. This versatile case makes it easy to go from watching movies to sending emails in one simple motion. Everything about this design is extremely thoughtful - from the soft inner lining that keeps your screen safe and cushioned, to the durable outer construction, and the cover that folds into a stand. 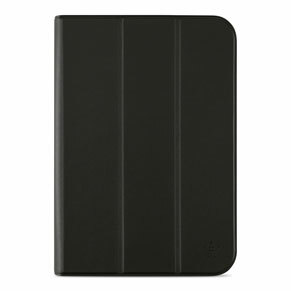 And because you want to keep your tablet lightweight and portable, this case protects without adding bulk. 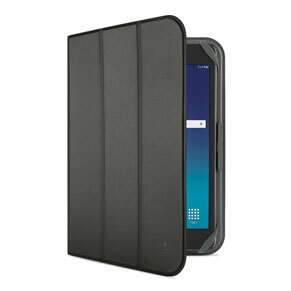 The Tri-Fold Cover with Stand is made of durable, lightweight fabric that's super soft to the touch. It's then molded to the shape of your tablet for an incredibly tailored fit. A velvety smooth inner lining keeps your screen safe and cushioned. Watching movies and videos on your tablet couldn't be more comfortable. 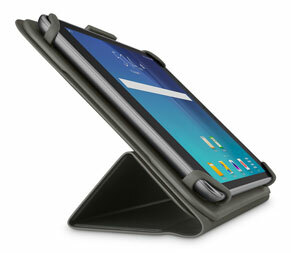 Just fold the cover all the way back, and your tablet's propped up at the perfect angle. The Tri-Fold Cover with Stand also folds into a lower, more ergonomic angle that puts less stress on your wrists when typing on your touchscreen. Rated 1 out of 5 by Geno76 from Cannot get the tablet in I struggled for 30 minutes to get the rubber corners around the tablet then gave up. One rubber corner is constantly pressing on the side power button. Taking it back. Galaxy Tab A - 8"